Good news for all Ritchie Blackmore fans. The high output level of many BSM Treble Booster and preamp units often causes problems with the following modulation unit, especially with the echo-unit that is necessary and important for the real post 74´ Blackmore sound. 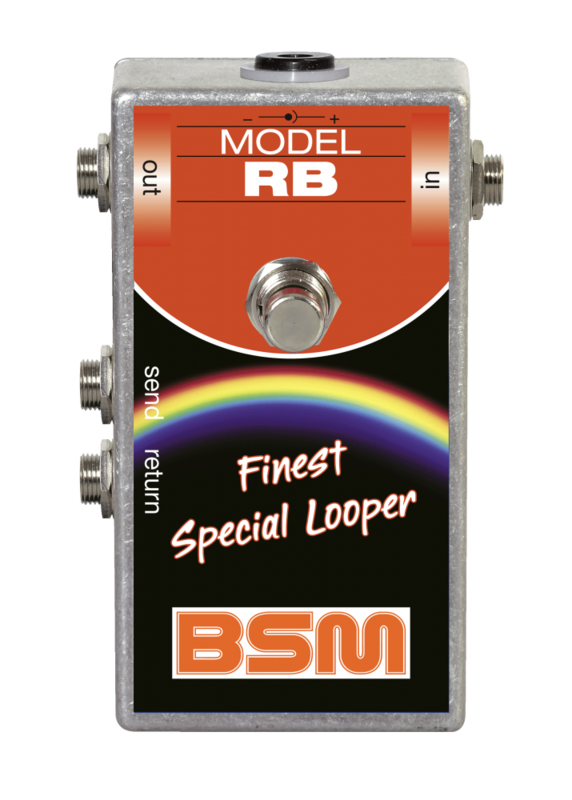 BSM solved this problem with the RB box (aka Ritchie´s Box), a pure passive looper with two custom-made special line-transformers. 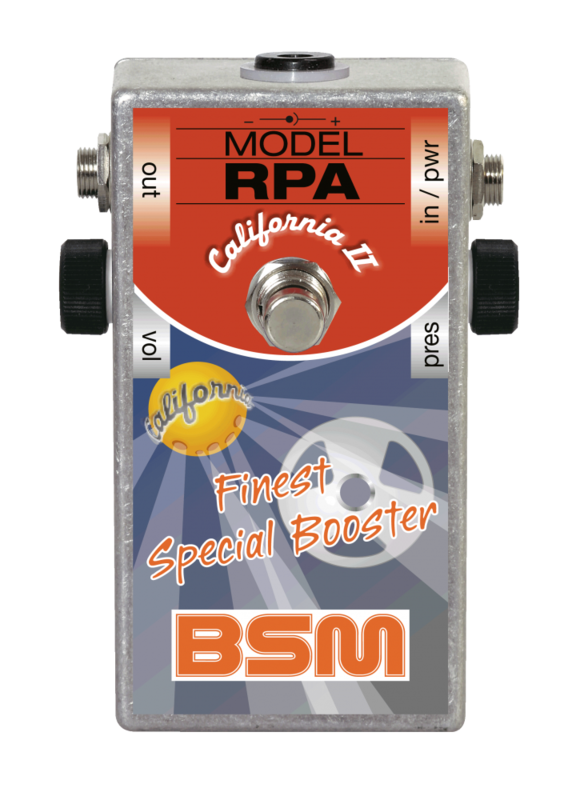 The new "RPA California II" booster is finally released now, and is the soul-mate of our California unit, complementing it with a different goal in mind. Whilst the well-proven RPA California primarily highlighted the best possible adaptation to the various pickups by means of an "EQ", with a view to generating Ritchie"s tone at its very best and under all possible conditions, the new RPA California II now calls for the correct pickups. The California II makes use of the free space gained via a volume pot. This allowed for the opportunity to map Blackmore"s tone even with small amps. 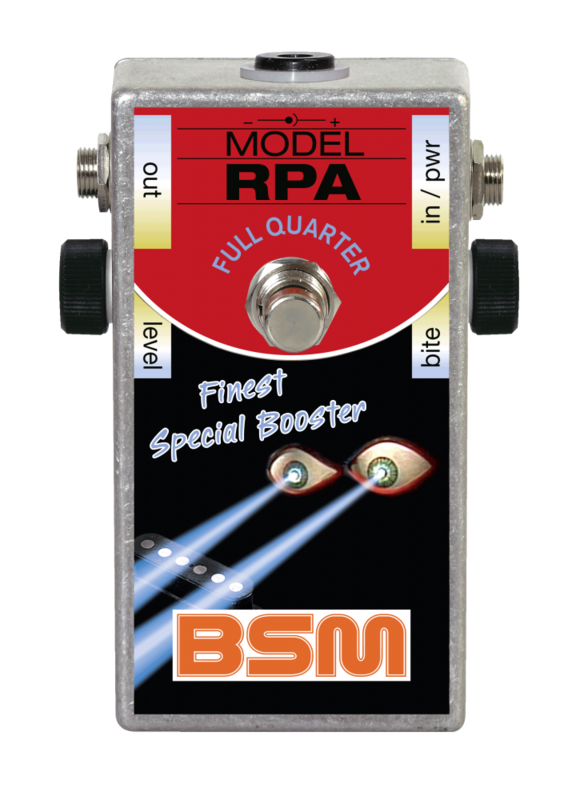 There is a new special preamp/booster pedal in the making: the "RPA Full Quarter", developed for fat single coil pickups like the "Schecter F500", the OBL 450XL (or similar) double blade humbuckers that Ritchie Blackmore used in the 1980 and beginning of the 90s. The pedal ensures no muddy or dull sound with powerful pickups like these in the operation of conventional amps to achieve a dynamic transparent sound. New "RPA California II" booster in progress and will replace the California unit. Whilst the well-proven RPA California primarily highlighted the best possible adaptation to the various pickups by means of an "EQ", with a view to generating Ritchie"s tone at its very best and under all possible conditions, the new RPA California II now calls for the correct pickups. The California II makes use of the free space gained via a volume poti. This allowed for the opportunity to map Blackmore"s tone even with small amps. BSM proudly presents Bruce John Dickinson from the famous English rock band "Little Angels" doing a few videos playing BSM stuff. Watch the RW-F, AP-WA, RM Early days pages. BSM designed a new private stock Booster just for the favourite taste of the company's mastermind. It was intended in the first place to emulate the sound of the 1975 studio recording "Ritchie Blackmore's Rainbow", second to achieve Ritchie's early Rainbow live sound that can be heard on the nov. '75 bootlegs, e.g. Bacon Theatre, NYC. The new "Albuquerque Booster" was inspired by Bad Company's live Bootleg from Albuquerque on March, 3rd 1976. Guitarist Mick Ralphs as a habit recorded the gig amongst many other concerts. Ralphs had a rich harmonic Les Paul overdrive sound and with drums and bass layering the perfect Rock basis for Paul Rodger's hoarse blues based vocals. New "Andy Powell/Wishbone Ash" booster in progress, the prototype will be shown to the public at the upcoming Musikmesse 2011. 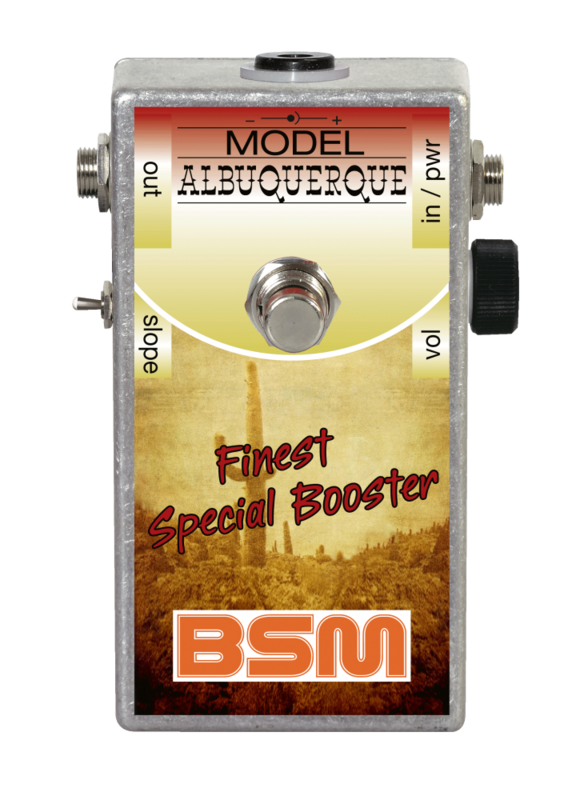 The new booster will give you the pearly-sweet and creamy live tone, known from the british guitarist Andy Powell during 1973-76. His band Wishbone Ash was one of the leading european bands at this time, well known for their harmonic chorus playing of the two lead guitarists. BSM will focus on the clean & boost live sound of the "Ballad of the Beacon" folk-rock song, more about it at the Musikmesse 2011. The "RPA Major", a hot-rodded version of the "RPA", is now available. The "RPA Major" starts, where the stock "RPA" ends - pure gain and a hard, agressive Blackmore lead-sound with all classical amps with master volume. Most possible punch with any pickup configuration because of a special EQ control. The "RPA Major" represents the high-gain sound of Blackmore"s agressive mid/end 70"s live sound, adapted and tweaked to match the modern taste of todays world.